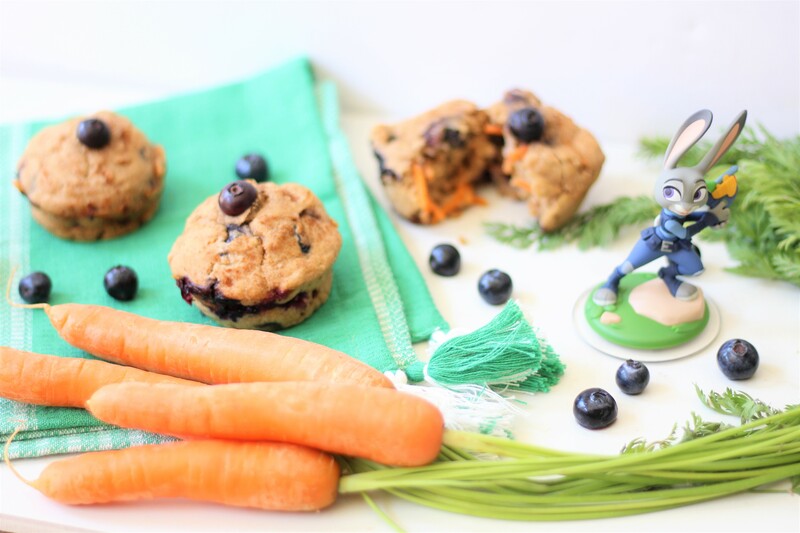 To celebrate National Blueberry Muffin day in Disney style, I created Judy’s Family Farm Blueberry Carrot muffins, a healthy, all-natural recipe inspired by Zootopia. Filled with carrots (of course any bunny’s favorite treat), and packed with juicy blueberries (another crop from Judy’s family’s farm), these muffins are a delicious breakfast or snack to get some fruits and veggies! Makes 1/2 dozen regular muffins or 1 dozen mini muffins. Whisk together flour, baking soda, baking powder, cinnamon, and salt. In a separate bowl, whisk together your applesauce, yogurt, vanilla extract, unsweetened almond milk, maple syrup, and your melted coconut oil (add coconut oil last). Combine both your wet and dry ingredients, mixing thoroughly with a spoon. Fold in your shredded carrots and blueberries. Place in a lined or greased muffin tin and bake for 15-17 minutes.